Duncan started painting professionally aged 19 and had his first exhibition in that same year. Soon after he gave up painting to study Architecture in London but returned to pursue his career as a full time artist a few years later and has continued to attract collectors who appreciate fine oil and watercolour paintings. More recently he has diversified into a more fluid approach using oils on gesso board as a medium for his beach scenes to show his love of the sea with its movement, rhythms and space. 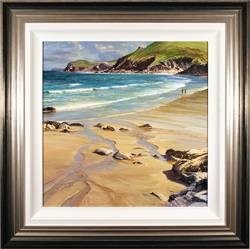 Duncan has been the commissioned artist to paint the Award winning hotels of the year for the Automobile Association for the last 10 years and has also undertaken several paintings commissioned by the Services. An accomplished artist who confidently uses both oils and watercolours, Duncan Palmar continues to push the boundaries of his talent and experiment with the relationships between medium, technique and tone. Please note that all Duncan Palmar art listed in this section has previously been displayed for sale and is not currently available.